With the growing popularity of our dear Old 55's Songfactors' Choice Top Ten and the promise of plenty more weekly Top 10's, I was pondering something. When I was trying to think of new nominees for week #5, I couldn't remember my nominations for week #1. Even worse I couldn't even remember the Top Ten #1! OK, so I could browse back to the first pages, but I thought what would that be like after 10 or 20 weeks or even later? Would I have to search half the thread to know whether my nomination was already in the the Top Ten a few weeks ago? Perhaps this thread would be more easily navigated if conversational posts were kept to a minimum, so the data boxes are most compactly recorded - pagewise. Firstly congratulations and thanks to Farin for his great efforts in compiling such a comprehensive list. Dates of all the songs included as well ! Well done Archivist. Steel has a very good point. I'm sure many others will like to commend Farin and have some comments or questions about "The Archives". Maybe we could do that through our regular Top Ten thread and keep this one essentially just for the Archives and Farin's comments, as far as possible ? I agree! All comments, questions and suggestions about the Archive are welcome and appreciated, but please post them in the regular Top Ten thread rather than here, or send me a PT, for the sake of readability and clearness. aa requested from now on, I will post the votes received for each song. That's the first time a 00's song made it in the Top Ten: Johnny Cash's Hurt! 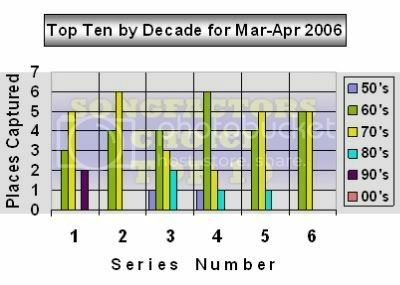 Top Ten #8 for period ending 10 May 2006. Now, I'd like to introduce a new feature to the Top Ten Archive. Our dear Judo suggested a graphic to illustrate the decades which are in the Top Ten. Farin! You are the man! Very professional...good work. No, no Judo did the graphic. I just post it. And originally it was larger. Does the forum restrict certain sizes? Ooooh... aaaaah... how do you do it? you're so smart! This is a great thread Farin. Well done. JUDO wants to remain in the background, but I want to tell everybody that this was his brainchild and he designed and produced it. Farin and I had minimal input.